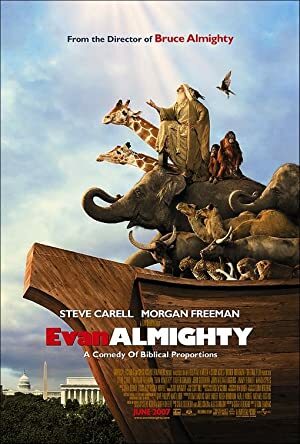 Evan Almighty (2006) – What's New on Netflix Canada Today! Buffalo newsman Evan Baxter is elected to Congress with the slogan, “Change the world.” He lucks into a huge house in a new Virginia suburb. His Capitol office is also fantastic, but there’s a catch: he’s tapped by the powerful Congressman Long to co-sponsor a bill to allow development in national parks. In steps God, who appears to a disbelieving Evan and gently commands him to build an ark. Tools and wood arrive in Evan’s yard, animal pairs follow, his beard and hair grow wildly, nomad’s clothes and a staff appear. Long grows impatient, Evan starts building, his family leaves him, reporters gather, and drought grips D.C. Still, Evan believes. But will he change the world?